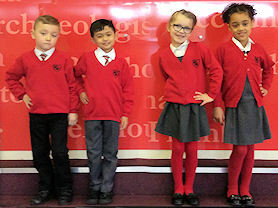 Some of our children proudly model our uniform. In all cases, black 'sensible' shoes should be worn as part of the school uniform - never trainers or girls fashion shoes or boots. Children are to have their PE kit in school contained in a school pump bag.